Today we have a guest post by my wonderful step-mother, Cathy Finnesgard. 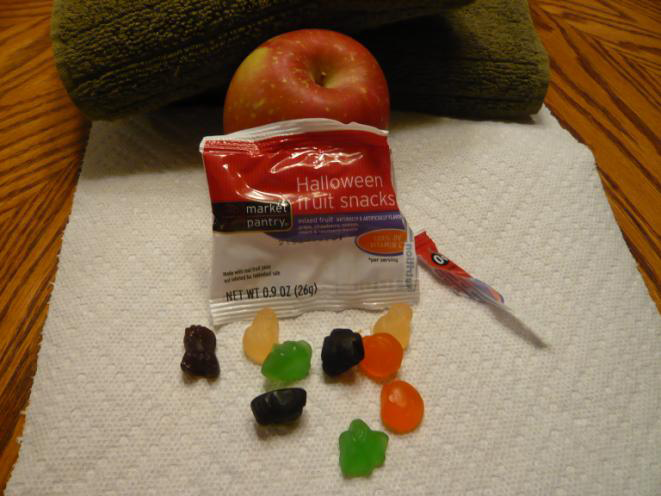 Here’s a little gem I picked up from the trick-or-treat basket at work—Halloween fruit snacks. Yum! What do you suppose is in them? Fruit, do you think? Would you consider them a healthy treat for your kids? I see fruit juice as the first ingredient (apple, pear). Then corn syrup AND sugar. What’s that at the bottom? White mineral oil? MINERAL OIL? Is that food? And what’s that next ingredient? Wax? But, there’s an asterisk pointing to a possible concern… it adds just a trivial amount of fat. Oh, I feel much better now. I was really worried my child might get too much fat, because fat is so dangerous, you know. But no, only mineral oil and wax – probably not enough to hurt anyone…provided, of course, the child eats only one little packet. What about two packets? What about two packets every other day? But don’t worry, there’s essentially NO fat, and that’s the biggest thing, after all. And they promise “freshness and quality.” Whew! I was worried there for a minute. Let’s look at mineral oil just for kicks. It’s used in the candy to keep the pieces from sticking together. You can actually feel the oil on the surface of the pieces. Mineral oil is liquid petroleum. It is a byproduct of the distillation of petroleum in the process of making gasoline and other products from crude oil. It is not a food; it is considered a drug when taken internally. Mineral oil is used to treat constipation. It coats the intestinal surface so that water isn’t absorbed into the body. Due to this property it also interferes with the body’s ability to absorb vitamins and other nutrients from food. So, how much of that vitamin C they infuse into this product do you think your child will actually absorb? Now what about the carnauba wax? Not to worry, it’s made from a plant. That makes it okay, I suppose, right? From About.com, “Carnauba wax consists of fatty acid esters (80-85%), fatty alcohols (10-16%), acids (3-6%) and hydrocarbons (1-3%). It is around 20% esterified fatty diols, 10% methoxylated or hydroxylated cinnamic acid, and 6% hydroxylated fatty acids. Carnauba wax has a very high melting point of …180-187 °F. It is harder than concrete and nearly insoluble in water and ethanol.” (Did you follow all that? Even the spell-checker had trouble with half those words.) But, don’t worry—it’s non-toxic and hypoallergenic—and you can eat it, apparently. Here are some of its uses: furniture and car wax, cosmetics, the coating on dental floss, and the coating on candy (helps with that hard shiny coat, like you find on M&Ms). I’m not sure what it’s doing in gummy-chewy “treats” like these, but we can be 100% sure of its freshness and quality. What’s the lesson in all this? 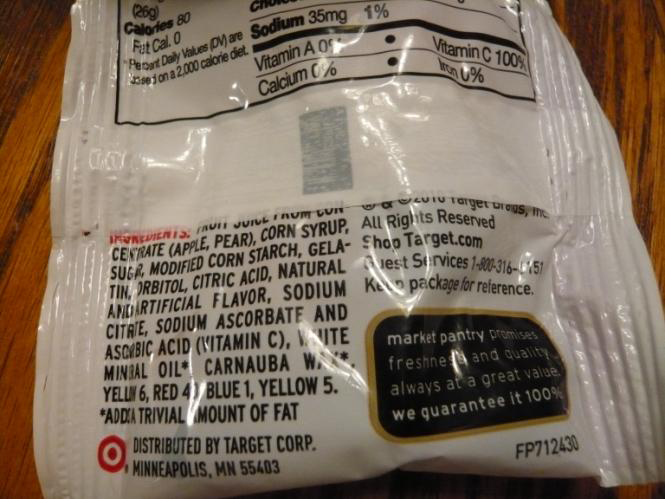 There are 17 (at least) ingredients in this little 80-calorie bag of mysterious processed chemicals masquerading as food. Why not just eat the apple? Your body knows what to do with the apple.